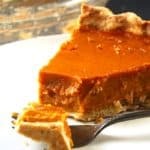 A maple-sweetened Pumpkin Pie made with cashew cream and with a whole-wheat, coconut oil crust. Soy free, vegan, low-fat dessert recipe. 1/4 cup coconut oil naturally hardened at room temperature. Add the water, a little at a time, mixing with the fork until the dough comes together in a bowl. Wrap tightly in cling wrap and refrigerate for at least 15 minutes. In a bowl mix well the pumpkin puree, maple syrup, cashew paste, cinnamon, nutmeg and vanilla extract. On a floured surface, roll out the pastry crust until you have a round that's slightly larger than your pie plate. Transfer the crust to the pie plate and crimp the edges with your fingers or with a fork. Place the pie in the center rack of the oven and bake 10 minutes. Lower the heat to 350 degrees and continue baking for 50-60 minutes or until the filling's set. A knife inserted into the center should come out clean. Cool the pie thoroughly on a rack. Chill the pie if possible, before eating-- it tastes best that way and is easier to cut.